This BergHOFF Leo herb cutter with accompanying board makes stripping, chopping and mincing herbs an absolute pleasure. 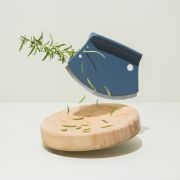 The cutter has 4 graduated holes for stripping the leaves off stemmed herbs - all you need to do is put the stem of the herb into the hole and pull it through. The leaves are stripped from the stem and collected on the board ready to be chopped or mashed. 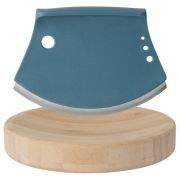 The half-moon cutter fits perfectly on the concave surface of the board, making the chopping or mincing very easy and comfortable. 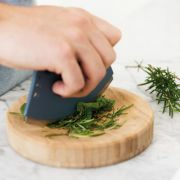 Simply rock the cutter back and forth over the herbs to prep your herbs like a professional. It's never been so easy to add beautiful flavours to your favourite meals!